Many website owners seem fixated on including the latest news on their homepage. However, is that really the right decision? Does anybody actually care about news? Less than 1% of visitors view a news release. We can see by looking at landing pages for visits that include a news release that, when a visitor lands on a news release page, it is typically a dead-end with most of those visitors leaving the site from that page. This caught my eye because it validated a suspicion that has been growing in my mind for a long time. This is the belief that in most cases heavily featuring new stories on a website homepage is largely pointless. Take a moment to think about this from the user’s perspective. The majority of users come to your site to complete a task. If your website promotes a service or product the likelihood of that task being to read news is extremely low. Instead, they come to the site in an attempt to decide whether to make a purchase or to get support if they have already done so. News does not factor into either of these scenarios. You may argue that news does help the user make a purchasing decision because news stories typically trumpet the quality of the product or service. Although I can understand this position and accept that in some situations this is correct, I believe there are three reasons why that is rarely so. First, users come to your site with a set of criteria to judge the appropriateness of your product or service. A good website should address these criteria directly, which is not something news does. The news may address people’s buying criteria indirectly (such as emphasising the quality of your offering), but that requires the user to make the cognitive leap. It would be much better to address their criteria directly. Second, although new stories have the potential to provide useful supporting information, they rarely live up to that potential. Instead, the news section of most websites seems to be where press releases go to die. Content is typically dry, un-engaging and focused on how great the organisation is rather than the needs of the user. It is not enough for example to write a press release saying how your organisation has won an award. Instead, you need to clearly explain how that benefits the user. The news section of most websites seems to be where press releases go to die. Finally, because news stories are often useless, I have a suspicion (although I cannot prove it) that users are becoming blind to them in much the same way as they are to banners. I’m beginning to believe that users simply ignore news stories as an irrelevance without even reading them. Should you bother with news? Please do not misunderstand me. I’m not suggesting that news should be entirely removed from the majority of websites. In fact, in a related survey we can over 30% of users expressed an interested in reading relevant news. I’m just saying that I do not think in its current state it deserves the prominence and homepage real estate it so often receives. That said, there are good reasons for including relevant, up-to-date content on your website, although admittedly this could be done through a blog as easily as a news section. Why add news to our websites? To improve search engine positioning. Relevant, well written, and engaging content will help your site rank well on Google. The regular updates will also encourage search engines to spider the site more often. To encourage users to link to your site. We hope that people will read our content and share it via social networks and their own sites, so driving more traffic back to us. Supporting sales. News has the potential to reinforce the sales messages on your site by demonstrating credibility and effectiveness. Provide customer support. News is often seen as a way of providing crucial information to existing customers. Unfortunately, all too often news fails in all four of these roles. Posts are stuffed with terminology no normal person would ever search on and content gives users no reason to share. Instead of news stories supporting sales or existing customers they are often nothing more than self-congratulatory press releases. News is often nothing more than self congratulatory press releases. How then can we approach things differently? How can we make news more effective? We need to move away from thinking about what we wish to say and instead, ask what users want to hear and what would engage them. Prospective customers coming to our site are not looking for news. Nobody says; I am thinking of buying X and so will check out their website’s news. We need to accept that our audience is indifferent to our news. We need to accept that our audience is indifferent to our news. The only exception is if you are trying to support an existing customer base. In this case they may well come to your site actively looking for news. However, it is important to realise they are looking for a particular type of news. They are not interested in which clients you have recently signed or awards you have won. They are interested in stories that relate directly to how you are supporting them as a customer. With this in mind, how does this shape what you write in your news section? 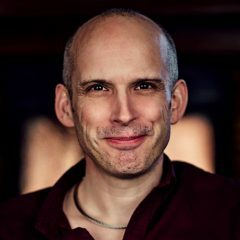 Obviously, I cannot advise you on the specifics of what you should be writing, but I can suggest some questions you should be asking as you come to write. Why would a user care? If you have an idea for a news story it is well worth asking why anybody would be interested in reading it. It’s such an obvious question but so often it is not asked. Instead, we just jump into broadcasting to the world oblivious to whether people want to hear what we have to say. It’s important that we really consider our answer to this question. It’s easy to deceive ourselves into thinking that somebody might be interested when they wouldn’t be. It’s even easier to write news that we know that one or two people might care about, when in fact the vast majority of visitors will be indifferent. Why would anybody share this? Another way of judging the worth of a news story is to ask “would somebody share this?” If one of our objectives is for news to be sharable and linked to, then we need to make sure it is worth sharing. We should write our news stories in such a way that they are crying out to be shared. We should write our news stories in such a way that they are crying out to be shared. They should contain quotes that are less than 140 characters, interesting statistics and inspirational content. Most news stories are too dry to justify the sharing icons they display. What one message do I want people to take away? Part of the reason many news stories fail to engage is that they are overly verbose. You need to communicate your key message quickly and move on. Of course, to do that, you need to know what that key message is. One way of identifying this is to ask what the key takeaway is. This will help you get to the core of your message. What next action do I want users to take? News stories are of no value in themselves (unless of course, you are a news website). They are a means to an end. Either that end is to convince a prospective customer to purchase or to support an existing customer. In either case, you should have a clear idea of what next step that user should take. This will help focus your article on what really matters. Although these questions will help better focus your content, it is not just content that needs to change in order to make news more effective. It is the format too. Previously I suggested that users were becoming blind to news because they expected it to be terrible. If that is the case then simply writing better news stories is not going to be enough. We need to really shake up the appearance and our definition of what news content is. One organisation who is doing this already (and who I believe we can look to for inspiration) is the University of Surrey. 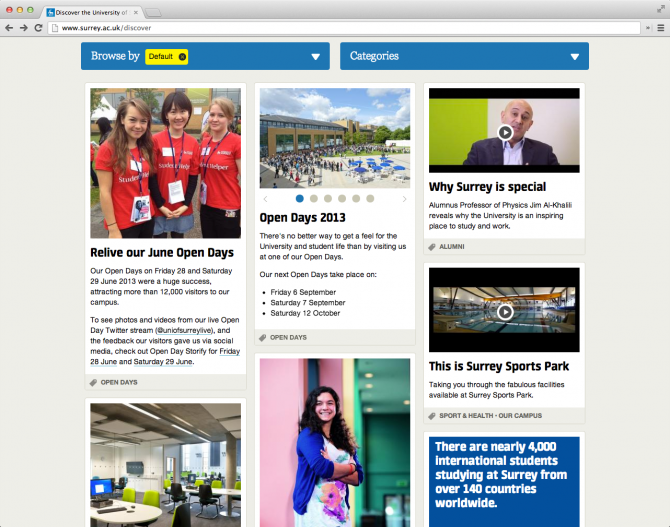 The University of Surrey has introduced a range of different formats for news and presented it in a visually pleasing way. They do two things that I love. Second, they mix news with other “snippets” of information about the organisation. As a result, they don’t call it news, instead referring to it as a “discover Surrey” section. This makes the content more engaging and less likely users ignore it. Staff profiles (show the people behind your organisation). Add audio as well as video. Add stats that are easy to share. Links to content you think your users will like elsewhere on the web. My point is that we tend to be narrow-minded about what ‘news’ should be. We don’t think beyond a written article (like this one) when actually we could do much more. It’s time we became more creative.